Radcliffe has become very interested in food and recipes and helping me come up with a menu for meals. But, as any mother out there knows, it’s hard to cook good meals during the school week when you are carting children to after school activities, doing homework, and dealing with bedtime. I have food allergies, which means I almost always make our meals from scratch (which takes forever), and I am limited to chicken and seafood as our protein…which gets redundant. It’s frustrating to work within the time constraints we have and my food constraints. Throw in two picky eaters, and well, you know the rest. Alessandra and Amy allowed me to share this recipe with all of you. It’s super easy, fast, and good for you…perfect for other families like mine for a weekday meal. This is called the Iron Chicken Dance because the chicken thighs are nutrient rich, packing all the iron we know is so important for our babies’ little bodies, and the salsa makes it “dance.” Don’t be intimidated by the term “sal-sa”—it’s super easy to toss together! Season both sides of the chicken with salt (if using), pepper, and dried herbs. Set aside. Remove the pot from the oven and add the black beans. Cover the pot with a lid and let the mixture rest for 5 minutes. 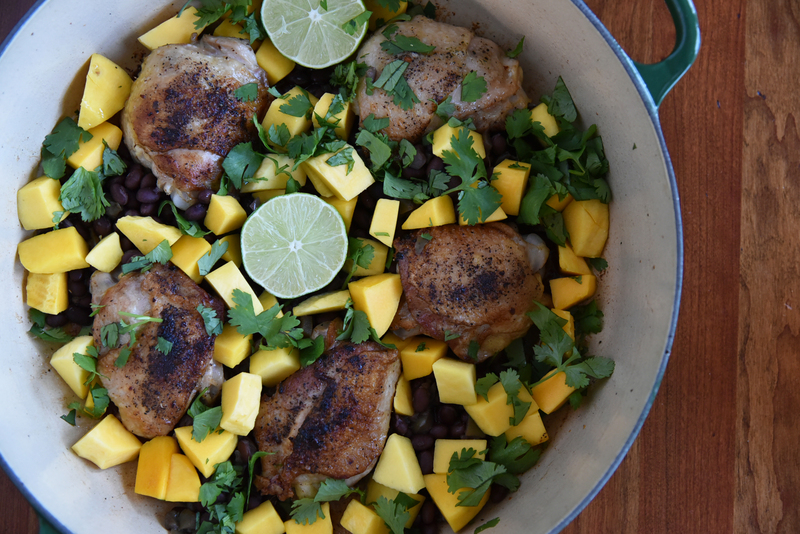 Add the mango, cilantro, and lime juice to the pot. Serve, cutting into smaller pieces ap-propriate for your baby, or puree the baby’s portion to desired consistency, adding small amounts of water as needed. Tip: If your baby seems hesitant or generally has a difficult time eating meats, try mixing in 1 teaspoon of sour cream. 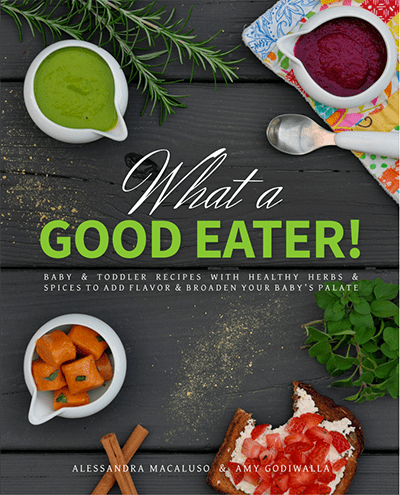 If she still seems hesitant, puree a small portion of the dish and spread it on a slice of whole wheat bread, creating a “pâté sandwich.” This may help make meats more palatable to babies/toddlers adjusting to the new texture. For an even easier and faster prepping your meal (cutting your chopping time in half), I suggest getting a Vidalia Chop Wizard, and store your cilantro in these fancy jars from Infinity Jars. You’re going to want these jars for everything, they are airtight ultraviolet glass jars and bottles and apothecary containers, designed to preserve the freshness of your herbs, spices, and natural products. This book has even more delicious recipes in it, which I am really looking forward to cooking for the boys, with the boys. Check out their website for more information: What A Good Eater! Pingback: Virtual Dinner Party with Fresh Bloggers and Free Recipes: You're Invited! - What a Good Eater!